I Support PEACE. | What Is? “Give Peace a Shot” is a photo petition for peace in the Philippines. We: 1) declare our support for the peace talks; and 2) urge everyone (government, rebel groups, etc.) to declare September 21 as universal ceasefire day. 2. Upload a photo with your peace message. 3. Tag the “Give Peace a Shot Fan Page” on your photo. 4. Spread the word about the campaign. Visit http://givepeaceashot.wordpress.com/ for the guidelines and details. GRABBED THESE INFO from Maria Krisna (her site HERE). ~My support call says “Depart from evil and do good; seek peace and pursue it.” found in the Bible verse of Psalm 34:14. This entry was posted in Arts, Fascinations, Inspirations, Journal, Portfolio and tagged Give Peace a Shot. 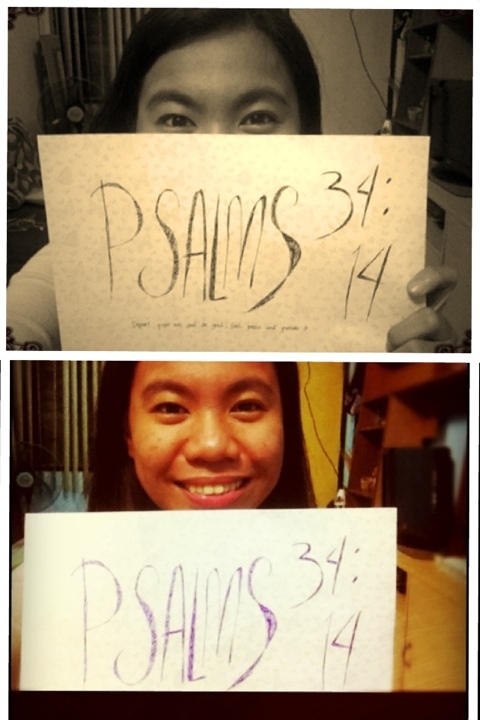 Psalm 34:14. Bookmark the permalink.